The Indianapolis Colts have signed unrestricted free agent defensive tackle Aubrayo Franklin. The team also announced that exclusive rights free agent guard Joe Reitz has signed his tender. Franklin, 6-1, 315 pounds, has appeared in 126 games, making 79 starts over his 10-year NFL career. He holds regular season totals of 431 tackles (230 solo), eight passes defensed, 4.0 sacks, three forced fumbles, one fumble recovery and one interception. Franklin played in 12 games (nine starts) with the San Diego Chargers in 2012 and totaled 23 tackles, including 19 solo stops. Prior to joining the Chargers, he played one season with the New Orleans Saints (2011) where he saw action in all 16 games for the fourth consecutive year and registered 31 tackles (13 solo). Franklin spent four seasons (2007-2010) with the San Francisco 49ers where he competed in 62 games (60 starts) and tallied 312 tackles (163 solo), 3.0 sacks, six passes defensed, three forced fumbles, one fumble recovery and one interception. He had one of his best seasons in 2009 when he posted career highs of 88 tackles (49 solo) and 2.0 sacks while recording his first career interception. Franklin was originally selected by the Baltimore Ravens in the fifth round (146th overall) of the 2003 NFL Draft and spent four years with the team. With the Ravens, he appeared in 36 games (one start), making 65 tackles (35 solo), two passes defensed and 1.0 sack. Reitz was originally acquired by the Colts from waivers on September 8, 2010 and has competed in 20 games (17 starts) throughout his two-year career. In 2012, he started eight-of-nine games played and provided time for quarterback Andrew Luck to break the NFL rookie record for most passing yards in a single game in Week 9 against Miami (433). He also helped block for Luck to throw for 205 yards in Week 16 at Kansas City, which set a new NFL rookie record for passing yards in a season (4,374). In 2011, Reitz competed in 11 games, including nine starts. He provided time for quarterback Curtis Painter to establish career highs in passing yards, touchdowns and passer rating at Tampa Bay in Week 4. He also helped open rushing lanes for running back Donald Brown to set a career-high with 161 rushing yards on 16 carries against Tennessee in Week 15. Perhaps no player at this year’s NFL Combine has dealt with that word more than Penn State linebacker Michael Mauti over his college career. From three season ending knee injuries in five years, to the death of his coach and a national scandal that ended any chance for postseason during his senior season, Mauti continued to take the high road through every obstacle. Given the choice to transfer to another school following the July 2012 scandal, Mauti elected to finish what he started in State College. “In one of the most unprecedented circumstances, we had a group of guys, our senior class in particular, who just bought in to what we were saying and our message, that we can take it as opportunity, do something special with the season,” Mauti said of Penn State’s 8-4 campaign this past year. Mauti turned in an All-American final season at Penn State but it was cut short after he was carted off the field following a knee injury on Nov. 17. The knee injury was the third in five seasons for Mauti’s and at this year’s combine, his medical records were a frequent topic. Will he be ready for training camp? NFL bloodlines for Mauti come from his father, Rich, who played eight seasons in the league. Following his final season in State College, the younger Mauti knew NFL teams would have a plethora of questions regarding his time at Penn state. He decided that the best way to address that would be a handwritten letter to all 32 teams, something that made a lasting impression with NFL personnel. After 15 seasons and 168 games, what is the motivation for quarterback Matt Hasselbeck to move on to his fourth NFL team? “I’d say that’s pretty high on the list,” Hasselbeck said of his desire to continue playing for the Lombardi Trophy. The news of Hasselbeck’s release came during a family vacation for the 15-year NFL veteran and he admitted that it came as a surprise. Hasselbeck realizes that he’s now walking into a building where the starting quarterback position is established but after talking it over with his family and agent, it was the Colts that continued to stick out. “Obviously the reputation that the Colts organization has and the kind of player that Andrew Luck is, more and more it made sense,” Hasselbeck said of his decision on Tuesday afternoon. Colts Head Coach Chuck Pagano spearheaded Indianapolis’ effort in acquiring the three-time Pro Bowl quarterback. Hasselbeck said he doesn’t personally know Luck and relied on Pagano’s insight into fellow players and coaches to inform the former Titans quarterback of the culture in Indianapolis. One area where both quarterback and coach already see eye-to-eye on is their vision of the Colts making a deep playoff run. In 2005, Hasselbeck led Seattle to Super Bowl XL but a fourth quarter comeback bid fell short after an interception in Pittsburgh Steelers territory halted the Seahawks attempt at the elusive championship. At the age of 37, this might be Hasselbeck’s final stop on a storied career with one chapter still to be written. His role isn’t that of the lead character but after 15 years of playing with a multitude of signal callers, it’s time for Hasselbeck to instill a young quarterback with some of the knowledge that made him such a commodity the past few days. “I’m just really thankful for all the different (quarterbacks) that poured in me and shared with me (their insights), some of the good, some of the bad,” Hasselbeck said. The Indianapolis Colts today signed free agent quarterback Matt Hasselbeck. Hasselbeck, a three-time Pro Bowl selection, has competed in 194 games (152 starts) over his 14-year NFL career. He has completed 3,029-of-5,018 passes for 34,517 yards, 201 touchdowns and 147 interceptions for a passer rating of 82.2. He currently ranks fourth among active quarterbacks in attempts, completions and passing yards and fifth in passing touchdowns. In the postseason, he has started 11 games, completing 237-of-406 passes for 18 touchdowns and nine interceptions for an 84.4 rating. He holds 22 career 300-yard passing performances in the regular season and two in the postseason. Hasselbeck joins the Colts after spending the last two seasons (2011-2012) with the Tennessee Titans. In 2011, he produced one of the best seasons of his career. His 518 attempts and 3,571 yards made up the fourth-highest single-season totals in team history, while his completions (319) ranked third in club annals. His 18 touchdown passes were the most since 2004 (Billy Volek), and with 28 completions of 25 yards-or-more, Hasselbeck had the highest big-play total since Steve McNair in 2001 (32). Prior to joining the Titans, Hasselbeck spent 10 seasons (2001-2010) with the Seattle Seahawks where he led the team to six postseason berths and their only Super Bowl appearance in 2005. In his time with the Seahawks, he posted an 82.2 passer rating, completing 2,559-of-4,250 passes for 29,434 yards, 174 touchdowns and 128 interceptions. In 2010, Hasselbeck started both postseason games to become the Seahawks’ all-time leader in playoff games played and started. He also set a franchise postseason single-game record with four touchdown passes against New Orleans (1/8/11) in an NFC Wild Card victory. In 2009, Hasselbeck became the Seahawks’ all-time franchise leader in career attempts, completions and passing yards, surpassing Dave Krieg in each category. He also set a single-game record against Detroit (11/8/09), completing 39 passes, including 15 consecutive, tied for second-most in club history. In 2007, Hasselbeck earned his third Pro Bowl selection after setting career highs for attempts (562), completions (352), passing yards (3,966) and touchdown passes (28). In 2005, he was named the starter for the NFC Pro Bowl squad after posting a career and NFC-best 98.2 passer rating, leading the Seahawks to an appearance in Super Bowl XL. In 2003, Hasselbeck earned his first trip to the Pro Bowl after guiding the Seahawks to their first-ever undefeated home record. He tied his own record for most 300-yard games in a season (four) and recorded then-career-highs of 3,841 passing yards, 26 passing touchdowns and an 88.8 passer rating. Hasselbeck was originally selected by the Green Bay Packers in the sixth round (187th overall) of the 1998 NFL Draft and spent three seasons with the Packers before being traded to the Seahawks prior to the start of the 2001 campaign. Since the Colts have cut Dwight Freeney, Colts fans have been in a particularly bad mood about this move. Everybody has been questioning this move and nobody likes this. Well let me tell you one thing, do you want a man who only gives you 10 tackles and 5 sacks a season? I know I don’t. I’m not saying that Freeney is a horrible player, but lets be honest; he played god awful this year. He just doesn’t fit the system. If a player doesn’t fit the system, why in the world would you keep a player like that? I’m not taking anything away from Freeney. He was the most explosive DEFENSIVE END, in football. Remember, I said DE. as a Defensive End in a 4-3, along with Julius Peppers, Dwight Freeney was the most explosive player of his time. Dwight Freeney is used to putting his hands on the ground and doing one thing, and that is getting after the quarterback. And he was good at it. But you cant make a guy like that stand and cover the pass and play the run. And you certainly cant just keep the defense in a 4-3 because of him. So what do you do? You have no other choice but to cut the man. Unless play DE in a 3-4 and gain an extra 30-40 lbs, and he did not want to do that. As of right now, anything beats how Dwight Freeney was playing. And Erik Walden is not the best LB in the NFL. But he is a Temporary replacement for him. He is not the long term solution by any means. but all I’m saying is that there wasn’t a legit reason to keep Dwight Freeney. He was getting old, slow and injury prone. The Indianapolis Colts today released safety Tom Zbikowski. In 2012, Zbikowski’s only year with the Colts, he started 11 games and totaled 47 tackles (28 solo), four passes defensed, one interception and 1.0 sack. In addition, he returned six kickoffs for a total of 123 yards. In Week 12 against Buffalo, he recorded his first interception since the 2009 season, to go along with six tackles, including three solo. For his career, Zbikowski has played in 64 games (25 starts), compiling 96 tackles (69 solo), eight passes defensed, three interceptions, 2.0 sacks and 59 special teams tackles. In eight postseason games, he has tallied four tackles, including three solo stops. After an eyebrow raising season in 2012, the Colts were faced with a lot of adversities and holes in the roster. The colts defense was ranked 26th in the league in Total yards, and 21st in points allowed. The revamp of the defense was necessary. Along with an ailing defense, the future face of the franchise, Andrew Luck was sacked close to 40 times. And I’m not going to say how many times he was hurried, hit, knocked down etc. because those numbers are too horrific to say or write. So there needs to be improvements on the O-Line. Ryan Grigson was faced with challenges last year with a 2-14 team. But now he has a promising team whose potential is sky high. And to keep it that way he needs to fill in the holes on the roster. Grigson has done a great job addressing the problems. He has signed a quality RT in Gosder Cherilus, and a versatile guard in Donald Thomas. The voids he has filled in for the defense has left me speechless. he signed LaRon Landry, an extrodinary talent at the safety position. He signed Erik Walden to replace Dwight Freeney. He added strength and teeth to the D-Line by adding Ricky Jean-Francois. 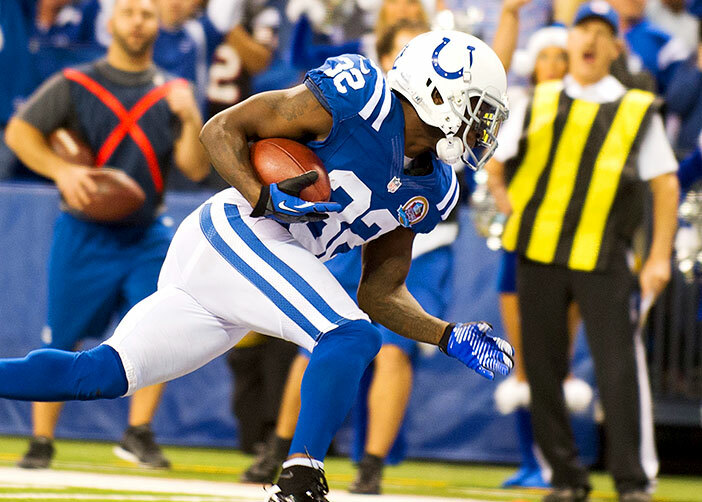 and he has added depth to the secondary by signing Greg Toler. Grigson has not only addressed the problems with the roster, but he took the stress off of getting someone in the draft. Grigson has outdone himself again! The sky is the limit in Indianapolis. I hope you guys Enjoyed this segment, feel free to comment and express your opinion! Stay Blue and GO COLTS!!!!! !